Comments/Context: One of the most rewarding and unexpected byproducts of seeing and reviewing so many photography shows over the past few years is that we are quietly building a surprisingly powerful archive of the history of this particular disruptive moment in contemporary photography. That growing pile of reviews allows us to do something important – we can start with an artist’s current show and then walk backwards in time show by show, observing the often minute changes in his or her style and approach. Given the speed at which today’s artists are iterating and incorporating new ideas, we need only go back a year or two to see meaningful change, and by tying all the loose end observations together, we can start to chart a fascinating trajectory of artistic thinking – indeed, paying attention does actually reap rewards. Just two years ago, and with the benefit of hindsight, we can now see that Kate Steciw’s works were in many ways at the beginning of a period of active experimentation, particularly in exploring the physical sculptural qualities that photographs can embody. At that time, her aggressively swirled combinations of stock imagery were still modestly sized, still rectangular and hung flat on the wall, and just starting to play with the idea of surface decoration (via stickers and glued on objects) and small wanderings outside the edge of the composite image onto the frame itself (Image Object at Foxy Production here). Later in 2012, her works became somewhat larger and more physically imposing, but generally continued to expand on these same lines of thinking (Kate Steciw: Boundless Hyper at Toomer Labzda here). But by the beginning of this year, Steciw had begun to leave the plane of the gallery wall behind, turning her constructions on edge and letting them triangulate out into three dimensional space (The New Beauty of our Modern Life at Higher Pictures here). 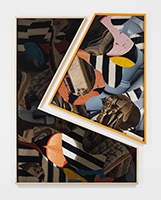 Just a few weeks later, the tyranny of a four sided frame was thoroughly broken, her works investigating various squared geometries, now enabled by complex custom frames (What is a Photograph? at ICP here). By the summer, many more variables were in flux: the kitchy surface decorations had been left behind (to be replaced by layered angles of tinted Plexiglas), the frames had become many sided polygons, small areas of opaque interruption had been introduced, and her works had left the walls entirely and floated out into the interior space of the gallery, with hanging chains or equipped with rolling casters (Fixed Variable at Hauser & Wirth here). At each step along the way over these past few years, we can see she has been actively adding and subtracting sculptural concepts, constantly and rapidly evolving her methods via trial and error/success. Steciw’s newest works start again with a foundation of mixed together stock imagery, but the underlying process seems less expressively swirled and more consciously layered this time, as if the textures and colors of woven textiles, striped knits, rubber bins, root vegetables, and a dirty backhoe had been iteratively cut out, piled up, and shifted around. All of the works on view here use the same collection of digitally interwoven image fragments as their baseline, so we can see the whole show as an integrated series, where the core photographic elements have been tweaked, recycled, and ultimately placed in a wide spectrum of frames and physical situations. While Steciw has returned to the comforts of the flat gallery wall, her newest compositions are much more complex in terms of frame shape and the use of sheets of transparent and opaque Plexiglas. These frames have jutting areas, open cut throughs, and combinations of colored paint and exposed wood, and the panels of Plexi have been cut with circles and arcs that allow the underlying stock imagery to show through or be disguised. The new works feel much more interested in interruption and partial obfuscation than ever before, and the layered abstract geometries are much more sophisticated. Seen together as a connected series, the sculptural circles and squares jump around, the squared corners echo each other, and the doubling effect ultimately leads to a separated diptych. It’s as if the soup of digital imagery has been trapped in rigid box, and we can watch as it pushes and presses against its confines, trying different strategies for breaking free. By allowing us to see her work change with such rapidity over the past few years and by participating in so many group shows with fresh out of the studio product, Steciw has to some extent moved beyond the typical mode of delivering us a self contained, fully formed artistic statement – like a band releasing singles and EPs instead of an entire album, we’re seeing each baby step of evolution instead of a brand new, stand alone body of work that emerges out of the darkness. It’s as if she’s embraced the continuous nature of the new digital/networked world, forgoing the old discrete steps and opening up her process to ongoing scrutiny, collaboration, and participation. That’s both exciting and dangerous, as real time art making runs the risk of being influenced by the flavor of the month artistic trends, which may or may not be potential dead ends in the long run. But if the process is relentless and continuous, perhaps the weaker ideas get flushed out relatively quickly and the searching forward momentum can move even more swiftly. With each cycle of iteration, Steciw’s explorations of the sculptural qualities of a photographic object have become more nuanced and complex, and these newest works are her most refined in terms of balancing and interconnecting the digital imagery and the its physical shell. Between the shaped frames and the tinted Plexi, she’s now enabling more interactions between the representations in the photographs and the curves and forms of the larger object, adding and subtracting in multiple layers to create harmony and dissonance. Given her propensity to keep moving, perhaps these ideas will look provisional in the future, but for the moment, she’s done some of her best work. Collector’s POV: The works in this show are priced between $6000 and $13000 based on size. Steciw’s works have not yet reached the secondary markets with any regularity, so gallery retail likely remains the best option for those collectors interested in following up.